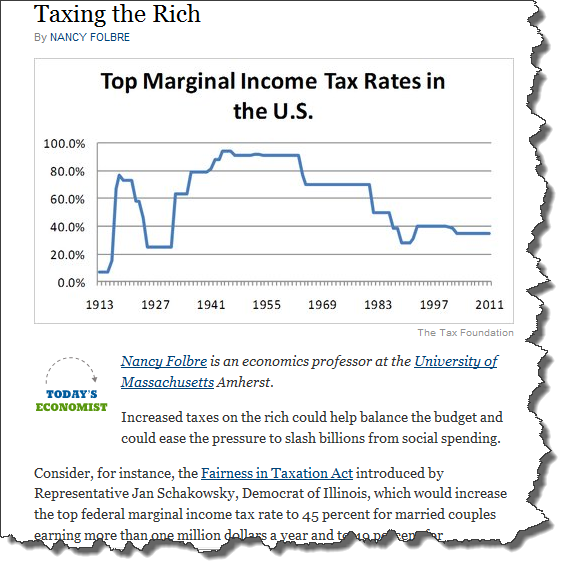 Per gallon of gasoline, are we paying more in taxes over the years, or less? In my last post, I examined the Federal gas tax and inflation adjustments. As it turns out, the overall price of gasoline adjusted for inflation just hasn’t changed that much over the past fifty years! Regarding the Federal tax of 18.4 cents per gallon as a tool to collect revenue, however, the impact is significantly weakened by inflation. It is a “unit tax” (fixed over time per unit of gasoline), and so it becomes a smaller fraction of price as the gas price rises. 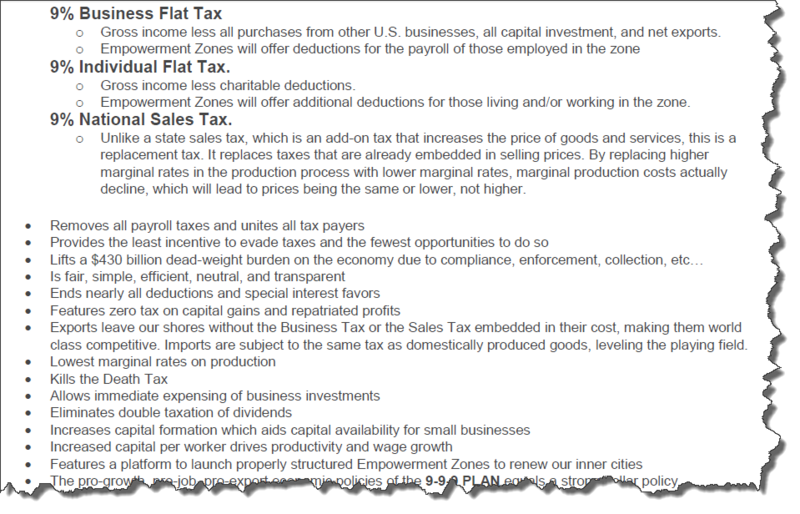 In contrast, any “ad valorem” tax would be a fixed percentage of price (like an 8% sales tax). When inflation increases the price, an ad valorem tax rises with it. State and local gas taxes in Illinois are a bit more complicated. 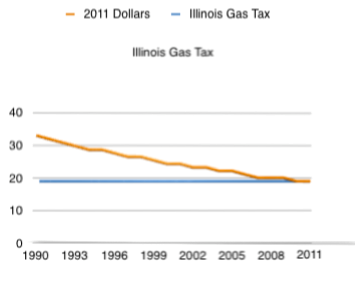 In 1990, the State of Illinois raised the gas tax from 16 cents to the current 19 cents per gallon – another “unit” tax. The flat blue line in the figure below looks at that same fixed 19 cents per gallon since 1990. The orange line shows its “real” value, adjusted for inflation, all in current 2011 dollars. It shows that the 19 cents today is really the equivalent of 33 cents back in 1990. So the real value of the state’s unit tax on gasoline has fallen from 33 cents to 19 cents per gallon. In addition to the 19 cent per gallon state gas tax, we also pay 2 cents per gallon to the city of Urbana. Furthermore, gasoline is subject to the general sales tax, which in Urbana is 8.75%. (It is composed of 5% to the state, 2.25% to the city, 0.5% to the county, and another 1% to the school district). Here is how it all works. Suppose the net-of-tax price of gas kept by the service station is exactly 3 dollars. Then the combined state and local ad valorem sales tax (8.75%) applies to that $3.00 per gallon. That tax would be $0.2625 (in other words, 26.25 cents). Then the federal unit tax is 18.4 cents, the state unit gas tax is 19 cents, and the city unit gas tax is 2 cents. The total of all those taxes is 75.65 cents per gallon. These four major taxes per gallon are shown in the table. Yet only the ad valorem sales tax can keep up with inflation. With every year that a unit tax on gasoline is not updated, the tax loses its value and fails to collect as much real revenue. The State of Illinois revenue from the 19 cent gas tax is falling in real terms with inflation, as all the necessary expenditures by the State are rising. In American politics, individuals who advocate a move in the direction of more limited government, greater reliance on market force, and who emphasize the role of individual choice are often labeled as conservatives, neo-cons, right-wingers, privatizers, or, in the last election cycle, tea partiers. Those who advocate a greater government role, restrictions on individual choice, and more regulation are labeled as liberals, progressives, left-wingers, and socialists. Lately, however, I have been thinking about how meaningless some of these phrases can be when describing specific policies reforms relative to the status quo. The reason is that U.S. economic policy as a whole lacks ideological consistency. This reflects, in part, the fact that our existing set of laws and regulations are often creatures of the time period in which they were passed. As an example, I want to focus on a broad issue on which I have spent much of my professional life as a researcher and policy adviser. Namely, how we as a nation choose to handle risk. In particular, how we allocate risk – and insurance for risks – across the public and private sectors. If you think about it, the allocation of risk is one of the primary roles of government in the modern era. Indeed, I once heard the U.S. government described as “a very large insurance company with an army.” This is not a bad description. The U.S. government runs the world’s largest life- annuity and disability programs (Social Security), some of the largest health insurance programs (e.g., Medicare, Medicaid, the VA system), a pension default insurance program (the PBGC), a deposit insurance program (the FDIC), an unemployment insurance program, a crop insurance program, a terrorism risk insurance program, and many more. There is tremendous scope for reasonable and intelligent debate about the appropriate role of government when it comes to intervening in private insurance markets. I do not pretend to have the only “correct” view – how could I, when some of the economists I most respect in this world have come to different conclusions than I have? But I do believe that I have developed a world-view about what constitutes a sensible and appropriate division of responsibility between the public and private markets that is informed by economic theory, empirical evidence, a dose of experience in how the government operates, and my own ideological predisposition towards individual freedom over government control. The world view that I have developed is one that believes that when it comes to the allocation of risk, we should find the least intrusive role possible for the government that is consistent with providing citizens with adequate opportunities for insuring against risks when doing so enhances societal well-being. 1. Can the private market achieve an efficient outcome without government intervention? Here, I define efficiency is the usual economist way of “1st best” outcome that would be generated by Adam Smith’s ideal of a perfectly competitive market without market failures. If the answer is “yes” – as I feel is typically the case with most markets for goods and services, then my belief is that the government should stay out of the way and let markets work their magic. 2. If the answer to question 1 is “no” because of the existence of a market failure (such as adverse selection or moral hazard in insurance markets, the existence of externalities, etc. ), then I ask whether the government is capable of over-coming the market failure. Importantly, the answer is often “no.” In many cases, the government faces the same problem as private markets. For example, if there is moral hazard in insurance markets (e.g., if people behave in inefficiently more risky ways when they are insured), then there is very little the government can do about it. The answer is sometimes also “no” because of “government failure,” that is, a political process that leads to even good ideas being poorly implemented due to policy being influenced by special interests or policies being poorly implemented by an inefficient bureaucracy. Whatever the reason, if the answer to this question is “no,” then I will again favor the private market solution, even with its flaws. 3. In the relatively small subset of cases where the private market does not work, where the government has the ability to overcome the market failure, and where the government solution is likely to be designed and implemented in a sensible manner, then I am entirely willing to back such a policy. Even then, however, I will favor the most limited form of government intervention necessary to overcome the market failure. Thus, for example, I have no problem mandating that drivers carry collision insurance because a government mandate can overcome the adverse selection problem that might cripple a purely voluntary market. Because my approach starts with a belief in the power of free markets and a healthy dose of skepticism about the political process and the skills of bureaucracies, my view is definitely “right-of-center.” But it is clearly not an unabashed “free markets all the time” view because it does recognize a need for limited government intervention in some cases. You may not agree with this view – but it is an ideologically and economically coherent and internally-consistent approach to economic policy. But now, let us return to the how my views would be labeled by the political process in America today. In practice, application of my world-view to policy means that I often favor having the government encourage insurance through automatic enrollment or even a mandate (in order to overcome adverse selection), but then allowing competitive private market to actually provide the insurance. 1. Is insurance mandatory or voluntary? 2. Is insurance provided by the government or the private sector? Now, let’s take my view about automobile insurance. In essence, I think we have a reasonable approach – namely, that we mandate coverage but allow private insurance providers to provide it. 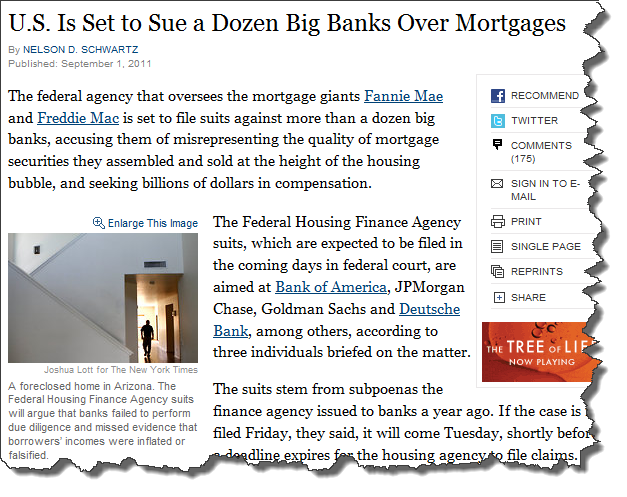 This has not been a major policy issue in recent years. So I can be fairly characterized as having a “do nothing” or “status quo” approach to this policy issue. At the other extreme, I cannot help but point out that the recent CLASS Act is precisely the opposite of what I would design. It is voluntary, so fails to overcome the main problem in the market but is provided by the government, despite the fact that the private market is fully capable of providing it! Here I just get labeled as a critic. So, where does this leave me? Am I a right-wing, small government, neo-con intent on privatizing major government programs? Or am I a left-wing advocated who wants to take away individual choice? Or am I a defender of the status quo? Or am I just a critic of government policies? The answer to all of these questions is “yes.” But this does not mean that I am a flip-flopper or ideologically inconsistent. To the contrary, it means that I am applying an ideologically consistent world-view to a wildly inconsistent set of existing public policies. At the end of the day, I believe that much of our political rhetoric has become vacuous, school-yard name-calling that does little to illuminate our policy discussions. I find it frustrating – even sad – that we so often mindlessly label and name-call instead of engaging in well-reasoned, analytical discussions of important policy issues. News from the West Coast today that Anthem Blue Cross, one of the largest private insurers in California, is raising the prices for the 800,000 or so people it sells individual health insurance policies by up to 39%. The Obama administration is not happy, to say the least. HHS Secretary Kathleen Sebelius fired off an angry letter to Anthem and its parent company, WellPoint, demanding an explanation. Of course, this also comes at a time when the Obama administration is struggling to make the case that health insurance reform is urgently needed, so this also provides a perfect example for them. The letter is kind of cool, since I have never seen an angry letter from a Cabinet Secretary before. The text is here. So, where’s the economics lesson here? In a competitive market, health insurance prices are driven by the cost of caring for the average person in the insurance pool. That means that healthy people usually pay more than their actual cost of care and sick people pay less. Although healthy people pay more than their average health expenditures in any year, they’re still willing to buy insurance because it provides them with, well, insurance. In the event that they have a car accident or other unexpected, large expenditure on health care, they’re protected against the financial consequences. This works fine as long as the premium (driven by the average cost of care) doesn’t get too high above what the healthy people are willing to pay for insurance against relatively rare events. Now, enter the recession. People are losing their jobs, wages for the employed are stagnating, and people are losing money on housing and financial investments. In light of these challenges, some healthy people are looking at their health insurance premiums, their income, and the likely cost of going without insurance, and deciding not to buy health insurance. This is a perfectly rational response to increasing premiums and decreasing incomes. However, it results in the remaining people in the insurance people being, on average, sicker. This means that the average cost of caring for the insurance pool will be higher, which will necessitate higher premiums. Unfortunately (and interestingly if you study this stuff), this leads to the potential for what is known as an “adverse selection death spiral.” The idea is that once premiums rise, the healthiest people who are still buying insurance may decide to drop out of the pool. Since the remaining pool is even less healthy on average, premiums will once again need to rise to cover their higher medical needs. And then the cycle starts over again. In extreme cases, the premium just keeps going up until nobody is willing to buy insurance. So, what next? Well, the adverse selection story holds in competitive markets. But, you can already see Secretary Sebelius telegraphing the administration’s punches. They will argue that the price increases are not due to competitive pressure and an increasingly unhealthy insurance pool but rather a greedy, for-profit insurer trying to take advantage of people when they’re down. For their part, WellPoint/Anthem will argue that this just shows why health reform is needed, but health reform of a fundamentally different sort than Obama has proposed. My prediction is that we’re headed for a highly charged series of Congressional hearings that boil down to an attempt to drive home to voters that something needs to be done. Really went out on a limb, there, didn’t I? Deep within the “Patient Protection and Affordable Care Act” – the short title of the 2000+ page health care bill winding its way through the Senate – is a provision that came from legislation previously known as the CLASS Act. The CLASS acronym stands for “Community Living Assistance Services and Supports” and is a plan to “establish a national voluntary insurance program for purchasing community living assistance services.” Essentially, this legislation would create a voluntary, public long-term care insurance program. It is understandable that there is tremendous interest in rethinking our approach to long-term care. The private market for long-term care insurance is quite small (e.g., only about 10 percent of the age 50-70 population is covered, and only about 4-5 percent of long-term care expenses are covered). The government is already the largest source of payment for long-term care services through Medicare and Medicaid. These expenditures are expected to grow rapidly in the coming decades due to population aging, among other factors. The legislation would create a public insurance program under the assumption that people cannot get the insurance privately. In other words, it seems to be assuming that the problem is that private insurers can’t or won’t provide good insurance. But there is not much evidence of this. To be clear, we know the private market is imperfect. My own research with Amy Finkelstein has shown that prices are higher than actuarially fair, and the benefits provided are not very comprehensive. But we also show that the limited size of the overall market is almost surely driven by limits to consumer demand for these products, not because of problems with insurers providing insurance. So if the government wants to solve the problem of people being inadequately insured against long-term care expenses, it needs to address the issue of demand. But, best I can tell, this legislation does virtually nothing on this front. For example, if you think people are not buying it because they underestimate the risk, or because they are in denial about needing care, or because they think they have substitute forms of care, there is nothing in this legislation that will change this. It is, after all, still voluntary to purchase it and simply having a government-run program is not going to change these beliefs. On the other hand, Amy and I also show in our research that the Medicaid program serves as an enormous disincentive for purchasing private insurance. In a nutshell, people do not want to pay for private insurance if most of the benefits they are paying for are simply duplicative of what Medicaid would have provided for free had they not purchased private insurance. This public program would have the same problem – why should I pay premiums for this program so long as Medicaid will still pick up the tab if I fail to pay the premiums? The feature that allows individuals to keep part of the benefit when Medicaid picks up the tab is presumably meant to address this, but I’m afraid it simply is not going to be sufficient to overcome this concern. The government seems to implicitly understand that there are limits on demand – their own estimates are that only 5% of the population will take up this insurance. That hardly sounds like a resounding success to me.